Summer at its worst! Lived off salads, juice, tender coconut water and fruits for a good part of last week. Our backyard mango trees have given a reasonably good yield this year. Prepared both sweet mango pickle and Avakai using home grown mangoes. 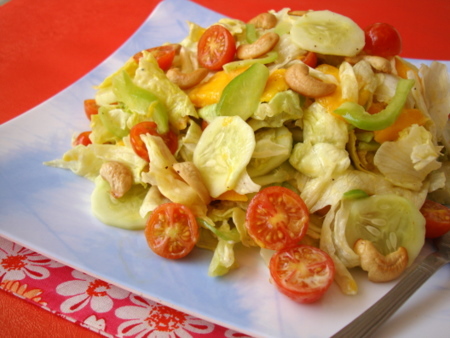 A salad I prepared recently is a mango based one with iceberg lettuce, cherry tomatoes and cucumber. I used honey mustard- mayonnaise vinaigrette which is simple yet flavorful. Wash, pat dry a head of iceberg lettuce and tear into bite sized pieces and place in a salad bowl. 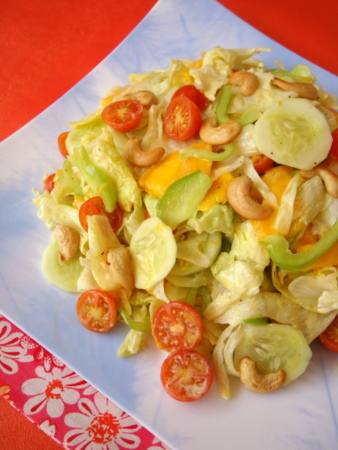 Add a sliced cucumber, peeled and sliced ripe mango (large), handful of cherry tomatoes, finely sliced bell pepper. For salad dressing, whisk 1 1/2 tbsps eggless mayo, 1 tbsp olive oil, crushed small garlic clove, 1 tbsp honey mustard sauce, 1/2 tbsp honey, 1/2 tbsp lemon juice, salt to taste, 1/4 tsp pepper powder. Pour this dressing over the raw vegetables and toss well. Refrigerate until use. Finish with nuts of your choice. I used toasted cashew nuts. That is one colorful, inviting and refreshing plate Sailu.. Love all the flavors in it..
lovely salad… youre so lucky to have a mango tree!! SIMPE, COLOURFUL, HEALTHY, MOUTH-WATERING SALAD, SAILU. LOVE UR AWESOME RECIPES AND PRETTY PICTURES. Thats so marvellous,colourful,fresh and flavourful salad..lovely.. I am a big fan of your recipes and tried many of them. They all came out well. I plan to try this one. Could you please tell me what brand of honey mustard sauce do you use? I used Fun Foods Honey Mustard. colourful, healthy, mouthwatering, tempting and what to say. very nice. for summer a good salad. Thanks for the recipe sailu garu !! Well, there will be water. You will have to remove only the salad onto a serving plate and let the water remain in the bowl. the recepie is awesome and i love it but where can i get the eggless mayo and please tell me which brand mayo do you use. Fun Foods is a good brand. You can find it in all departmental stores. I tried some of your recipes and they came out very well. Could you please provide the recipe for Palatalikalu which we prepare for Ganesh Chaturthi. My whole family loves it. Hi Sailu..I love this recipe and would love to try it. I stay in Vizag and find lettuce, avacados and other such imported vegetables difficult to find here..Could you please tell me where to find them in fresh condition (not tinned) in Vizag? Thanks a zillion! Spencer’s near the stadium stocks them often. Lettuce is hard to find most times.